Mr. Onstad is board-certified in personal injury trial law by the Texas Board of Legal Specialization. 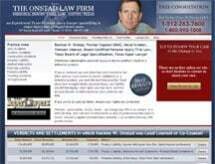 He was also honored with inclusion in Texas Super Lawyers in 2011 and rated AV Preeminent* by Martindale-Hubbell. Prior to becoming a respected personal injury lawyer, Mr. Onstad served as a captain and naval aviator in the U.S. Marine Corps. Mr. Onstad has successfully obtained numerous multimillion-dollar verdicts and settlements on behalf of his clients. In one notable case, he obtained a settlement for $13,650 million on behalf of two U.S. Army pilots who were seriously injured in a helicopter crash caused by defective parts. In another case, he obtained a $6,800 million settlement for a woman who suffered a brain injury on a poorly designed waterslide. In yet another case, he obtained a $4,980 million settlement for an infant who suffered cerebral palsy due to medical negligence. To schedule a free, no-obligation consultation about any type of personal injury case in Texas, call the Lakeway office of The Onstad Law Firm today.